Join us at the Curtis D. Menard Sports Center for our last game of the season against the Northwest Derby Company from Bremerton, Washington! Tickets can be purchased in advance here at Brown Paper Tickets (event # 3880627). Join us at the Curtis D. Menard Sports Center for our third game of the season against the Rage City All Stars! Tickets can be purchased in advance here at Brown Paper Tickets (event # 3880268). Join us at the Curtis D. Menard Sports Center for our first game of the season against the Petersburg Ragnarök Rollers! Tickets can be purchased in advance here at Brown Paper Tickets (event #3604291). We're rolling into season 8 and that means new beginnings! Interested in roller derby? Join Boom Town as a skater, skating official, non skating official, or volunteer. No experience necessary! Sunday, September 16 is when we'll be welcoming new members, as well as returning fresh meat. No experience necessary! Must be 18 or older (and out of high school) to join. We accept all shapes and sizes! Come see why roller derby is one of the fastest growing sports in the world. Need more information? Email us at recruitment.btdd@gmail.com. Alaska State Fair Parade: Memories in the Making! Continuing a 30+ year legacy, the Alaska State Fair Parade will again take to the streets of downtown Palmer on Saturday, August 25, starting at 11 a.m. This year, the Alaska State Fair theme is “Memories in the Making”, and the parade will be celebrating Palmer’s great memories. Check out your Boom Town skaters creating formations and showing skating demonstrations during the parade! 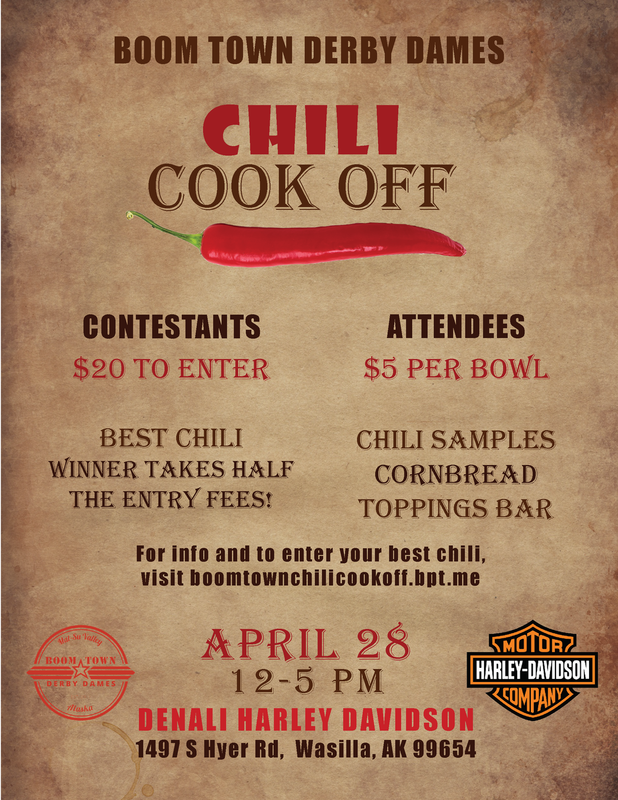 Boom Town Derby Dames Chili Cook-Off and Fundraiser! The Boom Town Derby Dames Chili Cook Off! Time: Doors open from Noon to 5:00 pm; setup by 11:45 am for chefs. A Special Thank You to the Denali Harley Davidson for allowing us to host our event in your space! $20 to enter! The best chili will be voted on by the public. Winner gets half of the entry fees! Applicants must supply their hot plate/heating device and serving spoon needed to serve chili. Fixings will be supplied by the Boom Town Derby Dames such as cheese, onions, etc, but if you have special toppings, you are welcome to bring them! an Enso Sleep Systems Queen Mattress. $20 a raffle ticket and two chances to win a prize! Who Let the Girls Out Fashion Show! During the Palmer 8th Annual "Who Let the Girls Out" event, come see your Boomies as models for Garden Gate during a fashion show at Klondike Mikes! For more information, check out the Who Let the Girls Out Facebook page! Have you ever wished there was a way to combine your love for roller derby with the magical world of Harry Potter? Now you can have the best of both worlds at Boom Town Derby Dames' final bout of the season. Come early and watch skaters get sorted into their teams. Be prepared with extra cash to cast curses and charms as you cheer for your favorite house. Visit the shops of Diagon Alley where kids and adults alike can buy wands, sweets, and more! This is an event for all ages so grab your family, wear your house colors, and get ready for the derby event you won't forget. Please join us April 7th, 2018. Welcome to Game 3 of Season 7 with the Boom Town Derby Dames! We take on the Denali Destroyer Dolls at home. Rematch time! Come cheer for your favorite valley team! Come see live roller derby in the Mat-Su Valley! 1001 S Clapp Dr, Wasilla, AK 99654. Junior roller derby skaters: Learn new techniques and strengthen your roller derby skills with Boom Town Derby Dames! Our Boot Camp consists of on and off skates classes. Instruction covers a full range of roller derby topics including skating skills, jamming, blocking, strategy, and skate maintenance. All classes are staffed by members of our league and headed by our training committee, which includes FrostByte and Athena Latina of the Boom Town Derby Dames. The Boom Town Derby Dames are in for their biggest challenge yet, as they take on the Rage City Allstars, Alaska's #1 ranked roller derby team! This is a first time ever battle as these two teams have never faced off before. Catch all the action live at the Menard Sports Center on Saturday, February 24, doors open at 6pm, wheels roll at 7pm. This is a family friendly event, with a wet section available for 21+ with proper ID. General admission and VIP table tickets are available online through Brown Paper Tickets, from your favorite Boom Town member, or at the door! Do you want to be involved in local roller derby? Maybe you've been interested for a while but need a little more information before jumping in. Come hang out with us and chat with Boom Town members about what it is like to be a part of roller derby. We can and will train anyone who is interested in becoming a skater, official, non-skating official, coach or volunteer. We accept all shapes, sizes, ages (over 18), fitness levels and backgrounds. All you need is the desire to learn and grow in the world of roller derby! Our only age requirement is that you must be at least 18 and out of high school. Want to find a fun way to challenge yourself and stay in shape? We're here for you! Want to be a part of a community that support each other in reaching their goals? We're here for you! Can't make this recruitment night, but still interested in joining Boom Town Derby Dames? Send us a message or email recruitment.btdd@gmail.com and we'll get you all the information you need. More details coming soon on how you can get hand made crafts and treats for your Boomies! Hosted by Am Vets Post 9 in Wasilla. Prepare yourself for a mashup derby extravaganza! Hosted by the Fairbanks Roller Girls, they are bringing a special event to our home in the Mat-Su Valley at the The Menard Sports Complex! Doors open at 4:45 pm. We start with the future of roller derby, a JUNIOR ROLLER DERBY game at 5:00 pm. They may be little, but they are fierce! Come cheer for your favorite junior! The main event starts at 7:30 pm for veteran skaters. See the derby showcase with skaters from around the state! It's War on Wheels! Check out our battle on the track against the Rage City Orange Crush team. Boom Town has a few new faces on our roster, as this will be the first game for some of our newest rollergirls! Come cheer on your Boomies in Anchorage at the AT&T Sports Pavilion on November 18th. Military veterans and active duty members get in free with ID! Thank you for your service! WE ARE BACK! Your Boom Town Derby Dames are pleased to announce our triumphant return to the Menard Sports Complex. Join BTDD for our first home game of the season against the Fairbanks Rollergirls from up north in Fairbanks, AK. Believe us when we say you're in for a smashing good time! Doors open at 6PM for Team Warm Up. BEER GARDEN, Concessions, and Team Merchandise. Game begins at 7PM. We accept cash and credit cards at the door! Ever wanted to try roller derby but not sure where to start? Were you a skater in a previous league or a few years back wanting to pick up the sport again? Tired of just going to the gym sporadically and looking for a new, fun workout routine to meet new people while getting your sweat on? If you answered yes or maybe to any of these questions, we have the program for you! Do you want to play roller derby? Maybe you've been interested for a while but need a little more information before jumping in? This event is for you! Come hang out with us and chat with Boom Town members about what its like to be a part of roller derby. NO EXPERIENCE NECESSARY! We can and will train any one who is interested in becoming a skater, official, non skating official, or volunteer. We accept all shapes, sizes, ages (over 18), fitness levels, and backgrounds. All you need is the desire to learn and grow in the world of roller derby! Our only requirement for age is that you be at least 18 and out of high school, other than that we're happy to have you! Want to find a fun way to challenge yourself and stay in shape? We're here for you! Want to be a part of a community of women who support eachother in reaching their goals? We're here for you! Boom Town Bonfire T-Shirt Fundraiser! Boom Town is hoping to travel from Alaska down to the lower 48 this year to try and gain world ranking at a tournament. Flights from Alaska aren't cheap, and then adding tournament fees and all that good stuff to the list really makes it hard for us to travel. Rage City Rollergirls in Anchorage is ranked 62. Fairbanks Rollergirls, 360 miles away in the interior, is ranked 287. Sitka Rollergirls, the third WFTDA ranked team in Alaska is on an island close to Juneau (590 miles from Anchorage by air only), and is ranked 139. So, that brings us to Boom Town. We are currently unranked and wish to change that. Not only do we want in on the competitive side of the WFTDA, but it will bring the entirety of Alaska to a higher appeal for others to travel here, and increase our own skill level by playing someone outside of the state. Please take a moment to click the link to our little shirt fundraiser in the hopes to knock out tournament fees (and if we sell enough, hopefully some of our airfare). Thank you for taking the time to read this and hopefully buy a new scrimmage shirt, a birthday present for a derby buddy or treat yo'self! "If you think 2 minutes is short, you've never played Roller Derby"
Boom Town celebrates Independence Day by walking and rolling in the Wasilla parade! Our last home game comes with a Boom Town favorite flavor: Far North! Come watch your Dames take on the Kenai/Soldotna team for a final showdown. Also, quite a few of our rookies are bout eligible. Support our up and comers in our last home game and get hungry for more Roller Derby with this little appetizer. We are all hoping to see you at the Tournament in May! Welcome to 2017! Are you prepared for the first match of the new year? What better way to ring in the new year with your Boom Town Derby Dames as they go head to head with Anchorage rivals, the Orange Crush!? The House Cup: Last Bout of the Season! On May 7th at 4:00 pm, doors will open to the Boom Town’s first ever Roller Derby House Cup. Skaters across Alaska can register for a chance to be sorted into one of the four houses of Hogwarts! Each of the teams (Gryffindor, Ravenclaw, Hufflepuff, and Slytherin) will have a chance to play each other for a total of six 20-minute rounds (each team plays three times). At the end of the sixth game, all of the points will be totaled and the house with the most points wins the Roller Derby House Cup! So what’s the catch? Well, for starters the audience will be calling the shots. Teams will be sorted evenly, but that means little when witches and wizards of all ages can pay to cast spells on the players. It might be anything as simple as ‘Reducio’ to remove some of the points a team has scored, or as crazy as ‘Confundus’ which will cause all skaters to move backwards for an entire jam! Even if you’re a roller derby Seventh Year, you’ve never been in a mashup quite like this before. The fun doesn’t stop at game play. Skaters are encouraged to pick ‘Harry Potter’ themed names, audience members can buy their own wands, and you might even spot the Golden Snitch! This will truly be a magical event for witches and wizards of all ages, skaters and spectators alike. Bring your entire family and check out our activities and games, watch a live drum show during halftime, and sip a Butterbeer while cheering on your favorite house derby style! Come early to watch The Sorting Ceremony at 4pm and stay late to celebrate during our on-site afterparty until 10pm. It all happens at the Menard Sports Center in Wasilla. Children under 6 are FREE! Spectators, click here to buy tickets! Skaters, register here! You must know the Magic word to be able to receive your Letter of Acceptance. Contact any Boom Town member for more details! Come to the fourth year of the United We Roll Statewide Tournament. Cheer for your favorite teams and skaters as they battle their way up the ladder to State Champions! Will anyone defeat the Rage City Rollergirls from their last year's victory? Save the Date! Orange Crush is playing our Boomies one last time before the season ends. Cheer on your team while they get a little Vitamin OC! Just in time for Valentine's Day! What better way to say, "I love you," than with roller derby? Treat your lovey to a fantastic night of action and heart racing excitement as we take on the Babes from the North Pole! Want to become a part of the roller derby universe?